Players that ordered the Legacy Edition of Call of Duty: Infinite Warfare to get the Modern Warfare Remastered edition are in for a treat as the game is getting a fresh batch of DLC next week from Activision and Infinity Ward for the hefty sum of… completely free! 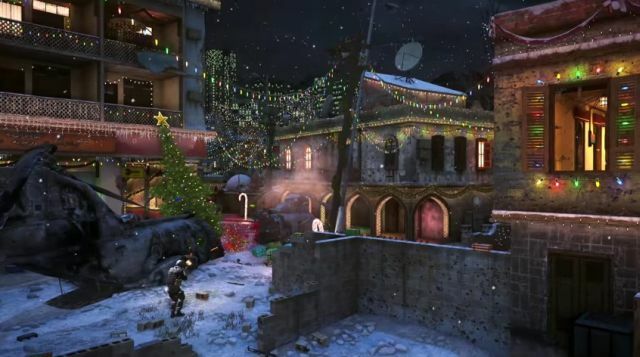 On December 13, players will receive will receive the remaining six remastered maps: Bloc, Countdown, Pipeline, Showdown, Strike, and Wet Work, along with the Hardpoint and Gun Game modes being made available in Modern Warfare Remastered for the first time ever. Plus, fans will get an additional chilly bonus with the remastered Winter Crash map. Check it all out in the new trailer below! One of the most critically-acclaimed games in history, Call of Duty: Modern Warfare Remastered features improved textures, physically based rendering, high-dynamic range lighting and much more. The original, award-winning Call of Duty 4: Modern Warfare set a new standard upon its release for intense, cinematic action, while receiving universal praise as one of the most influential video games of all-time. Winner of numerous Game of the Year honors, Call of Duty 4: Modern Warfare became an instant classic and global phenomenon that set the bar for first-person shooters, and now it returns for a new generation of fans. Pick up the Legacy Edition or Digital Deluxe Edition of Infinite Warfare and get Call of Duty: Modern Warfare Remastered by clicking here for Xbox One and PlayStation 4.